Summary: Typical Tex-Mex food in a typical atmosphere. There aren't many places to eat in Cloverdale, in particular on a Monday night when some restaurants are closed. Still, there are some choices and as I was in the mood for guacamole, we decided to head to La Hacienda. 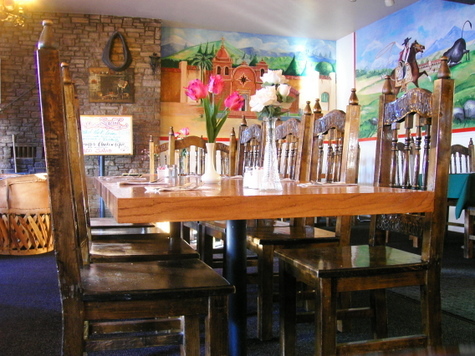 La Hacienda is your typical Mexican restaurant, decorated with murals of Mexican scenes and furnished with heavy wooden tables and chairs. Indeed, the chairs have "La Hacienda" carved into their backs. The room is pretty dark. The menu was typical Tex-Mex stuff at typical prices. I ordered the steak fajitas ($13) while Mike had a burrito ($8). The fajitas were fine. The meat was tasty and reasonably tender, and there was a good amount of it. 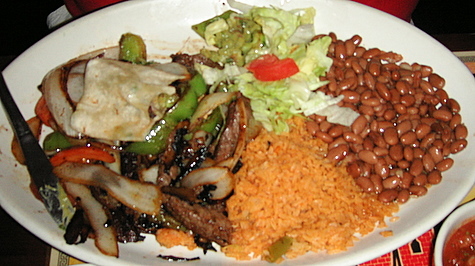 It came with roasted onions and peppers, as well as an enormous quantity of rice and beans. There was guacamole, which was more like a green salsa, tasting more of onions and tomato than avocado, but it wasn't bad. The dish didn't come with pico de gallo or sour cream. Mike's burrito was unremarkable but perfectly acceptable. There was a good balance of meat to beans and rice. Black beans were not an option. Service was erratic. We got seated and got our food almost straight away, but we had to wait a long time for our bill. 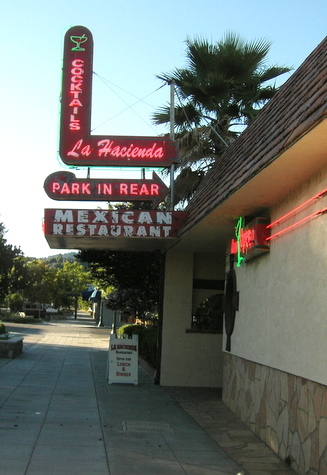 In all, La Hacienda is not a bad place to eat when you find yourself in Cloverdale.